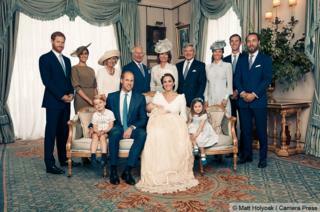 The christening of Prince Louis has been marked by the release of a set of family photographs. 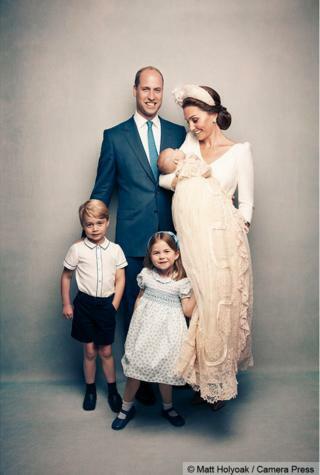 The four images were taken by celebrity photographer Matt Holyoak following the baptism in The Chapel Royal at St James's Palace. "Everyone was so relaxed and in such good spirits, it was an absolute pleasure," Mr Holyoak said. The photos were taken in the morning room and garden of Clarence House. A further picture of the baby prince, alert and with a wide open-mouth smile, was taken by Matt Porteous, chosen by the Duke and Duchess of Cambridge to be their private photographer for the day. The christening on Monday 9 July was the first time William, Kate and their three children had been seen together as a family of five. Louis was sleeping as he was carried into the chapel for the 40-minute ceremony. The duchess was heard describing him as "very relaxed and peaceful". "I hope he stays like this," she joked to the Archbishop of Canterbury, the Most Reverend Justin Welby. 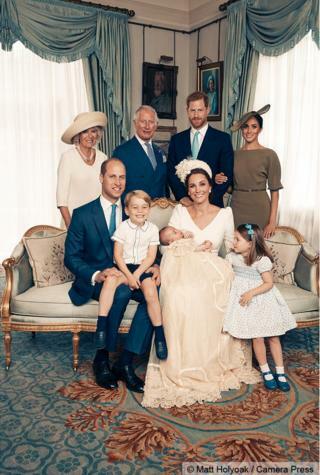 Also appearing in the photos are the Duke and Duchess of Sussex, the Prince of Wales and the Duchess of Cornwall, and the Middleton family, including Kate's sister Pippa and her brother James. 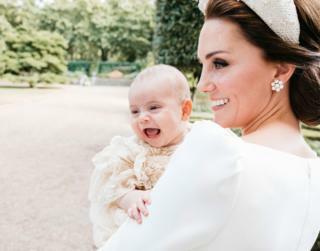 Image caption Prince Louis at his christening, being held by his mother, the Duchess of Cambridge. Mr Holyoak has previously taken the portraits marking the 70th wedding anniversary of the Queen and Prince Philip. He said he hoped he had captured the "joy" of the christening in his photos. All pictures subject to copyright.